We had some joyful days of near-summer like weather, which gave me some much needed time to start working on the yard. All day I sweated and hauled mulch around, picked up sticks and random boards that had been blown from piles of construction materials. With great satisfaction, I used the snow shovel to load mulch into the wheel barrow. And I'll tell you, it was very satisfying to use a snow shovel for a spring activity on a warm day. This spring has brought more gratitude than ever before after that harsh winter. I stopped off at the garden center and was their only customer, came home, and planted a few pansies in pots on the front step. Now, their smiling little flower faces greet me each time I enter the house. Do you ever notice how much spring can re-energize? Not just the earth around us, but ourselves, too. It's almost as if the longer days allow us to see more clearly in the extended light. What a perfect time of year to celebrate the resurrection of our Savior. Around the Home: The Mister is planning a massive push on our home reconstruction, hoping to get at least our bedroom, dining room, and front entrance way completely rebuilt. This will be hard, messy, and laborious, but a huge step towards completing our home. It will mean sleeping in the living room (where we slept our first year) so the floor structure can be rebuilt in the bedroom, and like all of our projects, it will mean a lot of inconvenience. But it's important and essential, and needs to be done. The chaos will commence shortly. On the Bookshelf: I'm proud of my fellow Anabaptist researcher and blogger, Erik, from Amish America, whose book Success Made Simple: An Inside Look at Why Amish Businesses Thrive has just been published and is getting a lot of attention. This is a major achievement, and a very interesting and informative look at the world of Amish-run businesses. Congrats, Erik! 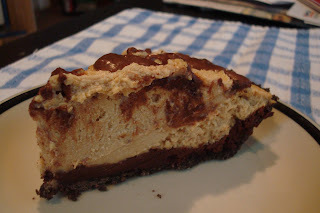 In the Kitchen: Is there anything better than the combination of chocolate and peanut butter? This is a simple pie recipe to which I added my own special touches. And by special touches, I mean chocolate. Preheat oven to 375. Bake crust for about 4 minutes so it's a little crispy. Let crust cool. In a double boiler, melt chocolate chips and whisk in milk until smooth. Using a quarter cup measuring cup, reserve 1/4 cup of the melted chocolate and set aside. Pour the remaining melted chocolate into the crust to coat the bottom, and then let cool in the refrigerator. While the chocolate is cooling in the crust, mix the cream cheese, confectioners' sugar, and peanut butter together until smooth. Fold in 1/2 of the whipped topping. Spoon the mixture into the crust on top of the chocolate bottom. Spread the remaining whipped topping over the peanut butter mixture, and then drizzle the reserved melted chocolate on top. Cool for at least two hours before serving. Unbelievably good! He's pulled one leg off of Lambie, but that's it so far. He just enjoys making it scream for the most part. What will future readers of your comments think of that?! HA! You know what I'm talking about, though. Or at least I hope you do. I hope the reconstruction goes relatively painless for you. We've used our living room as the kitchen before, with our coffee table as the dining table and we actually served company this way. This looks so delicious, I can't wait to try it! Thanks for posting, love you blog. Hi Monica thanks for the very kind plug and you too IMPH! (: Just got to Lancaster County 2 hours ago and have decided to track down the local version of this pie. Wish me luck! Hello Monica its been a while haven't forgotten ya is been a hard winter..This pie looks so good.. Looking forward to playing catch up with your blog..